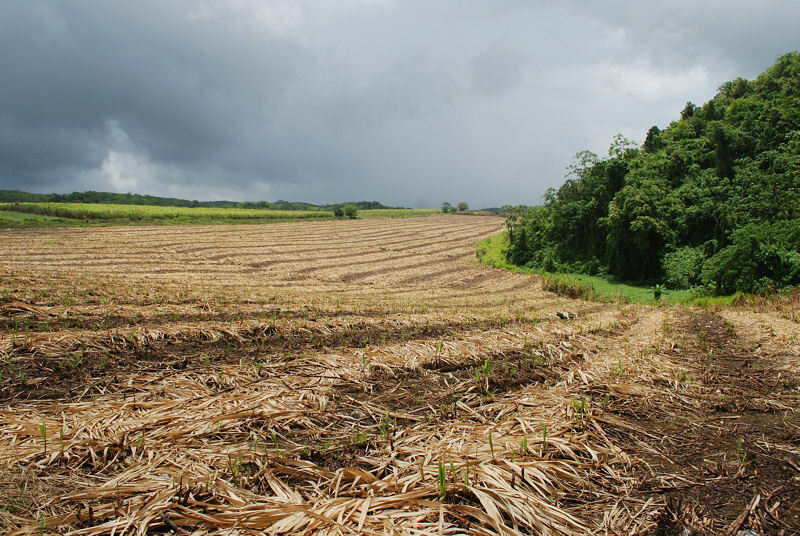 Fringe of a dry forested hillside ringed by expansive sugar cane fields north of Kinloss, Jamaica. Photo: Richard L. Goldberg. © 2009. While shooting a series of macro photos on a dry forested hillside in Jamaica I noticed a rather bold and brazen ant strutting his stuff on a small limestone rock. The ant seemed to match the description of Solenopsis invicta, the scientific name for the much dreaded fire ant; also referred to as RIFA, or Red Imported Fire Ants. Possibly Solenopsis invicta, the much dreaded fire ant near Kinloss, Jamaica. Photo: Richard L. Goldberg © 2009. Its reddish-brown head and body with a brown abdomen was the tip off that my encounter with the 5mm hymenopteran was not something to just brush-off. I immediately checked to see that I did not unearth an entire colony before kneeling down on the forest floor to photograph the ant interloper — wait a minute! Was I the intruder on the isolated hillside ringed by large expanses of sugarcane fields? 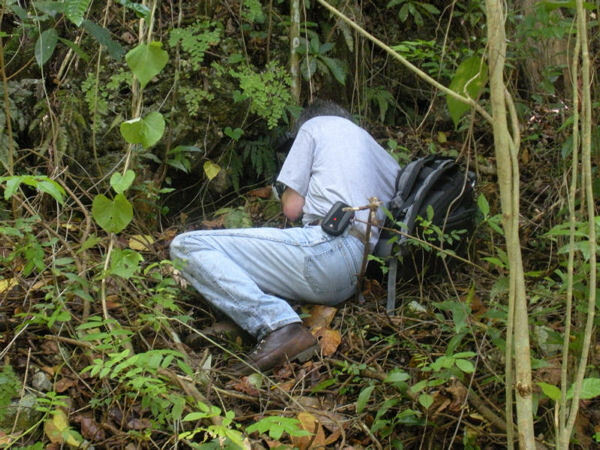 Photographing an ant species on the floor of a dry forested hillside north of Kinloss, Jamaica. Who's the intruder? Photo: Alan Gettleman. Just mentioning the name fire ant is enough to make a person’s skin crawl. Get stung by one and you can expect intense soreness and swelling for days. Stumbling onto and getting stung by a colony of fire ants is enough to take down an able-bodied outdoors man for the count. Numerous video clips on YouTube show people succumbing to attacks by fire ants; not the type of material that you are likely to see on America’s Funniest Home Videos. There is nothing funny about being attacked by a colony of fire ants, and not just for the obvious reason. Black ants, red ants, sugar ants, crawling ants, mad ants, biting ants, rain ants, soldier ants, and duck ants are just some of the biting ant species found in Jamaica as listed on an official notification “potential invasion of the fire ant” published by the Biodiversity Branch of the National Environment and Planning Agency of Jamaica. 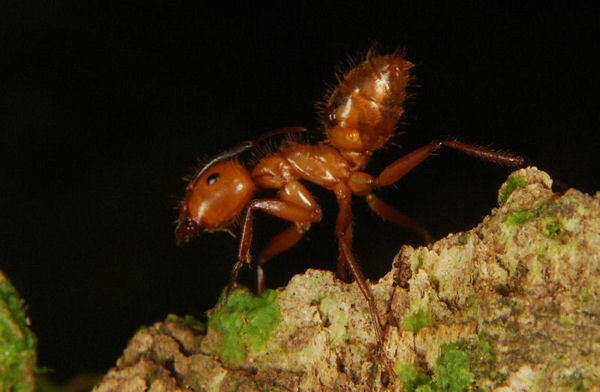 The introduction of Solenopsis invicta, has now been confirmed in Jamaica. The notification states that no other ant species can inflict a sting as bad as the fire ant. The South American native ant species has been introduced into a number of other West Indian islands, the U.S. mainland and as far away as Taiwan and Australia. 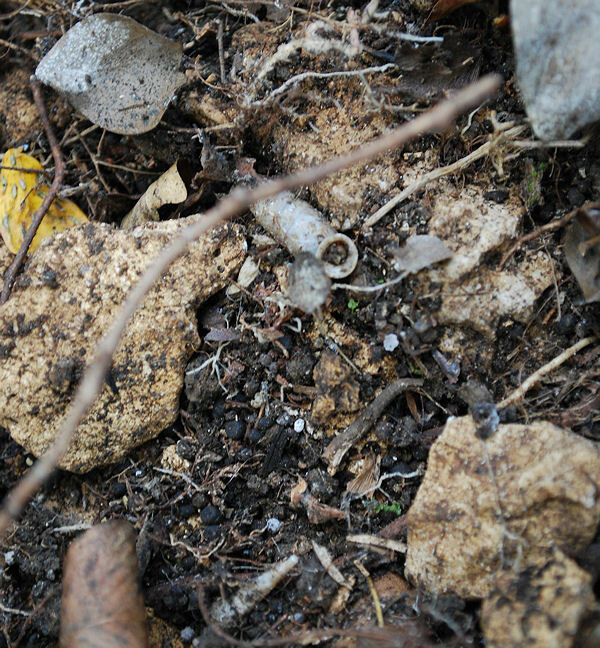 A close encounter with a dry limestone hillside, an ideal habitat for ants in Jamaica. Photo: Richard L. Goldberg © 2009. Ants in Jamaica are especially abundant among the dry limestone forests of central and western Jamaica. Leaf litter, tree trunks and open limestone cliff faces are especially good habitats where ants are frequently found in large numbers; the same habitats that we hike through in search of capturing other Jamaican lifeforms on film. So it is not uncommon to have RIFA encounters. Sure, ants of any type are a nuisance to people whether the biting type or not. Yet the impact of introduced ants on indigenous species is far more troubling. Fire ants are aggressive, especially when provoked by disruption of their colony. Though one of the best know ants to inflict painful stings, the fire ant is not the only aggressive ant species. 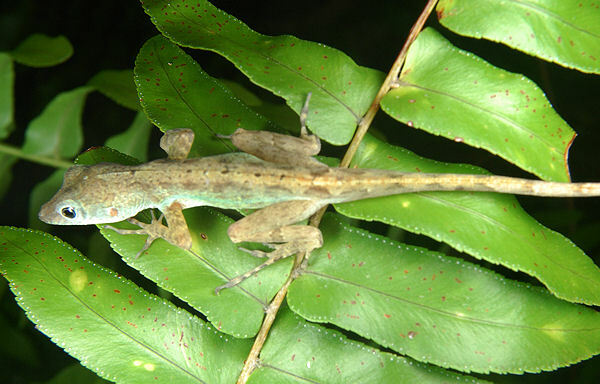 Anolis lizard foraging in the foliage at night in the Cockpit Country of Jamaica. Photo: Richard L. Goldberg © 2009. The myrmicine ant Crematogaster brevispinosa, a species related to the common household ant (Myrmica molesta) is known to make unprovoked attacks on juvenile and possibly adult Anolis lineatopus, an arboreal iguanid lizard native to Jamaica. In fact, when caged with almost 40 C. brevispinosa under laboratory conditions, a juvenile A. lineatopus died within hours. It seems then that such aggressive behaviors by ants can influence the local distribution and abundance patterns of animals sensitive to it such as the Anolis. This conclusion was based on a field study in Kingston, Jamaica where there was a direct correlation between the abundance of the ant with the lack of the lizard and vice versa. Though known to feed on other insects and invertebrates, this small Jamaican centipede species lives side-by-side without harming the pulmonate snail, Dentellaria sloaneana in a delicate balance that allows both species to survive in the same habitat. Photo: Richard L. Goldberg © 2010. It may take many tens of thousands of years for native species to find a balance in its environment. Introducing an aggressive species like fire ants into a pristine environment will quickly and negatively put the natural balance out of kilter. The University of Mona study between ants and anolids is just one of hundreds of similar ecological investigations that have revealed that introducing non-native species can and do have significantly negative impacts on native faunas. 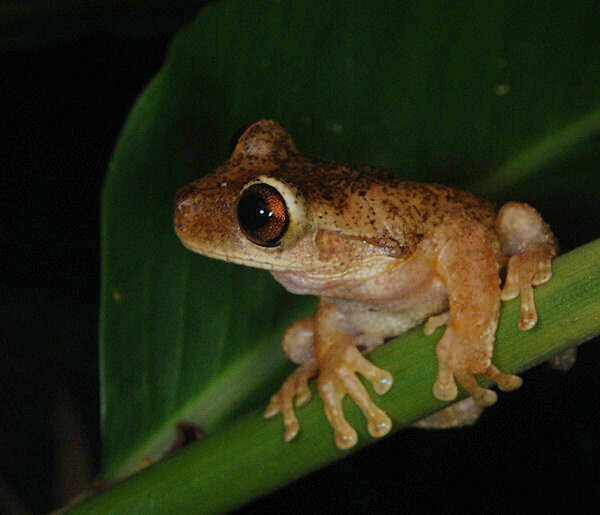 The Tree Frog is just one of the many native Jamaican species that can be negatively and quickly affected by the introduction of non-native species. Photo: Richard L. Goldberg © 2010. National wildlife management agencies continually monitor the introduction of invasive species within the borders of a country. The next time you return from overseas and grumble over the numerous questions your customs card asks about bringing back living plants or animals, or spending time on a rural farm, it is because non-native species can accidentally and easily be brought back in your bags; yes, even a fire ant! More than your skin will be crawling if one of these species successfully hitches a ride in your duffel bag! The tropical biosphere is inhabited by animals of far greater color than any other zoogeographical zone on Earth. The Phylum Mollusca, and in particular the terrestrial mollusks, the land snails, develop shells that have some of the greatest diversity of color and pattern among all living organisms. The often brilliant coloration and bold patterns attracted ancient societies who used the shells for ornamentation purposes. Today, naturalists with a bent on conchology are still amassing collections of these brilliantly colored snails for aesthetic reasons, but also for scientific study. The question of why these molluscan species have developed a multitude of colors and patterns can be best understood through the foundations of evolutionary science. Amphidromus adamsii, an extremely varied 25mm (± 1 inch) land snail species that may exhibit the ultimate in intra-population variability. Photo: Richard L. Goldberg (copyright 2009) from BiologySource 11 by L. Sandner, et. al, published by Pearson Publishing. Land snails can develop shells with myriad colors forms within one population (intra-population variability), or may vary from the norm only in separated populations (inter-population variability). Occasionally a species can exhibit both phenomena. The Darwinian concept of natural selection can best be used to explain why a snail species can vary locally or over its entire range. Forms of the half inch-size Fly-Speckled Polymita, Polymita muscarum, a species that exhibits inter-population variability throughout its geographical range in Oriente Province, Cuba. Left - A color form found at Loma de Calixto; Right - shells from Port of Vita. The Port of Vita form also exhibits considerable variation within the population, or intra-population variability. Photo: Richard L. Goldberg. The external appearance of a shell — color and pattern, for instance — are likely to be influenced by natural selection when determining the genetic make up of a snail. Extreme color polymorphism in a population perhaps indicates that looking different from your neighbor is advantageous, making it more difficult for predators to develop a search image, such as color and contrast, to locate their prey. The unique color form can then spread rapidly in a population. Amphidromus laevus from Timor-Leste. An example of frequency dependent selection where the typical dark banded pattern is occasionally replaced with a unicolored shell. Photo: Richard L. Goldberg. This phenomenon, known as frequency dependent selection, may explain why some intra-populations of snails in the genus Amphidromus from eastern Indonesia often have unpatterned or strikingly different colored shells mixed in among the predominantly multi-colored or strongly patterned shells. Natural selection is typically considered to favor one form over another, thereby shifting the bell curve, yet frequency dependent selection flattens that bell curve and spreads it out. An example of genetic drift. Left - Amphidromus wetaranus from Wetar Island, Indonesia. Right - A form of the same species from a small satellite island off Wetar Island. The red central band found on all specimens of the satellite island form is never found on the Wetar Island form. Photo: Richard L. Goldberg. One explanation for inter-population variability may be a phenomenon called genetic drift. To illustrate this, let’s say a population gets split in two, one on island A, and one on island B. Both populations might start off identical, with chances at 50/50 for a particular trait. It is unlikely that the offspring will be 50/50. They may be 47/53, and the subsequent generation may be 43/57. Over many generations, the percentages will fluctuate up and down at random, and they can end up being very different from where they started. Yet, in the real world, a new mutation doesn’t start at 50/50. It might be only 1/10,000 or 1/100,000. By chance it can have more surviving offspring than average, and slowly increase in the population. Smaller populations will drift faster than large populations. But, if by chance that first mutant does not have any surviving offspring, that trait disappears. This is a more likely scenario. So, genetic drift tends to eliminate variation within a population and increases differences between populations. Over a period of time, the populations from islands A and B will end up looking very different. These shells of Amphidromus columellaris from the Tanimbar Islands, Maluku Region, Indonesia show little variation within the population. Could that balance be tipped by the founder effect? Photo: Richard L. Goldberg. Inter-population variability might also be explained by the founder effect. The snails that colonize an island may represent only a small fraction of the parent population’s genetic diversity. If a rare mutant color form is mixed in among the new colony, a colony that was 1 in 1000 in the parent population, it may instantly be 1 in 10 in the new population. Given a brand new set of environmental influences, the population may evolve in whole new directions from its parent population. Environmental factors such as the geology, climate, flora, fauna, and food are all suspected contributors to the rise of a unique shell appearance. To reduce the competition with other species which overlap in some aspect of their niches, a phenomenon called character displacement occurs. Shell, behavioral, anatomical or biochemical characters eventually deviate from the ancestral form to allow the species to survive with its neighbors. Character displacement might also manifest itself in the color, pattern, and even the form of the shell. Changes brought on by one, or a combination of, these biological concepts can eventually render an isolated population unable to interbreed with the parent population, producing a situation which makes speciation possible. Isolation is the key ingredient for a species to evolve, and natural barriers provide the necessary separation to allow speciation to take place. Whether the barrier is a series of mountain ridges separated by deep valleys, or islands separated by wide channels as in the case of some species of Indonesian Amphidromus, isolation allows a species to evolve independently from its ancestral form. Though these concepts are often difficult to understand when evolutionary science is not your main focus, understanding that tropical snails do change and adapt to external factors and random influences is enough to appreciate just how diverse a snail species can be. This is not your run-of-the-mill helical garden snail trucking along in your backyard at a snail’s pace. The species with its other-worldly form is Adamsiella pearmanaeana (Adam-see-el-la pear-man-e-ana), found only in a small area within Trelawny Parish, Jamaica, another of Jamaica’s exotic endemics. Scientists use fancy terminology to describe the sometimes bizarre ornamentation created by snails. In this case, flaring peristome (expanded lip), strongly ribbed whorls, and deep impressed sutures are just some of the many terms that help to identify a species. Species descriptions are an essential part of animal identification. For mollusks like the terrestrial Adamsiella pearmanaeana, close observation and comparisons of the shell and animal characteristics between specimens of the same species and similar species help scientists to better understand the relationship among and between snails. If the form and structure is unique, it is then classified as a distinct species and placed in a genus with species of similar ilk. The process of observation, description and classification spans all living organisms. It is the methodology of biological sciences. At best, scientists can only speculate about the functionality of shell form through observation of a species in situ (in its natural habitat) and comparison of form and functionality with similar species. Field studies become an essential part of gaining a broader understanding of a species like Adamsiella pearmanaeana. For instance, the flaring lip is like a wide brim of a hat. In fact, scientists believe that the lip provides the snail protection when it is sealed to a hard surface, acting as a barrier around the aperture or opening to the shell (sometimes referred to as the mouth of the shell). But wait, there’s more. Why the notch along the inner lip? And why is the tip of the spire truncate or broken off? Here’s where it gets complicated. Okay. Let’s gather some facts. We know that Adamsiella pearmanaeana is an operculate snail. Through observation we find that when aestivating, its shell is tightly attached to a limestone rock and the operculum is set in place in the aperture. The snail is able to slightly move out the plug-like operculum to allow air and moisture in and wastes out. Now, if you view the shell from the top down into the truncate spire, it is hollow. The spiral shell is wrapped around an open column that leads to the notch in the lip at the bottom of the shell. Essentially the notch provides a pathway from the aperture to the central column leading up to the opening in the spire; the shell structure seemingly provides a protected pathway for the snail to have contact with the outside world while keeping out beetles and other insects that prey on the snail. The shell then acts as a barrier and breathing tube. Seems plausible to me! If, in fact, Adamsiella pearmanaeana is one of thousands of examples of how shell form has had a direct role in protecting a species from its predators, then it is no wonder that these extreme forms have played a significant role in species survival for tens of thousands of years. Biodiversity is one of those buzz-words bounced around in the media when hailing the discovery of new species or bemoaning the loss of those species from global warming and other human-induced changes to the environment. To scientists biodiversity is the holy grail of scientific disciplines. Simply put, biodiversity relates to the variation of living organisms found within an ecosystem. And the health of an ecosystem can be measured from datum derived from biodiversity research. Jamaica may be the biodiversity capital of the world. Much of the flora and fauna of the island is endemic, meaning it is found no where else in the world. The terrestrial mollusks (snails) are a fascinating group of living organisms to study island endemism. Most of the 500+ species of terrestrial snails are endemic to Jamaica; many are found only in narrow niches. Why is this important? Consider this — a snail with a geographical distribution of only a few square miles can become extinct if its habitat is altered or wiped out through deforestation by farming or strip mining. In Jamaica, the reasons for habitat destruction are numerous, but not unique to the island. Deforestation is a story for another time on another Blog. In the coming days, I will post pictures of many endemic snail species known only from small micro-habitats around Jamaica. The beautiful and exotic shapes and forms of these species belie the earthy and often harsh environments that these molluscan species inhabit. Getting to these remote habitats sometimes involves long treks through muddy rain forests fraught with insects and stinging foliage. The reward for enduring such hazards is contact with the natural beauty of Jamaica’s flora and fauna — a part of Jamaica that most people never experience when staying at coastal resort enclaves. Among the fascinating snails found only in a small swath of territory Jamaica’s central Parishes of Clarendon and St. Catherine is the operculate snail, Adamsiella jarvisi. Operculates are classified as prosobranch, meaning the anatomical arrangement of the gills is forward of the heart. Most of the sea snails and all of the operculate terrestrial snails are prosobranch. The operculate snails on terra firma have evolved a trap door or operculum to protect the snail when withdrawn into its shell. Adamsiella jarvisi is a small ± 10 millimeter (mm) size species that lives on limestone rock. It is often found aestivating (a form of short-duration hibernation) while attached to a rock face with the spire hanging in a downward direction. The operculum is affixed to the foot of the snail (the small thickened circular white disk visible on the back of the snail’s foot in the photograph above). When disturbed or threatened by a predator, the snail withdraws into the shell and the hard, calcarious operculum seals the snail into the shell. Snail predators include beetles and birds. 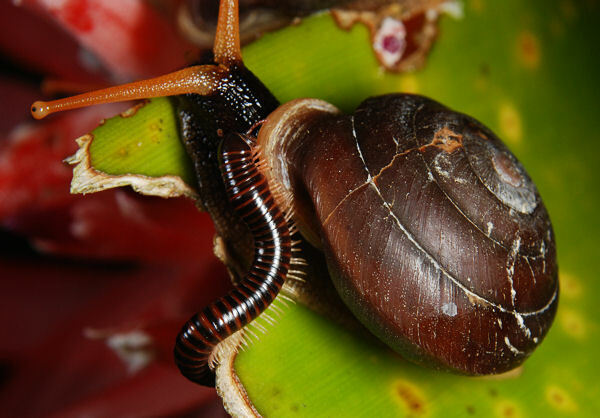 More than half of Jamaica’s endemic terrestrial mollusks are operculate snails. Stay tuned for more terrestrial trackings from Jamaica.